Overview - Le Quattro Volte (The Four Times) is an ineffably beautiful meditation on the mysterious cycles of life. Set in Italy's mountainous region of Calabria, it traces the path of one goat-herder's soul, as it passes from human to animal to vegetable to mineral. Director Michelangelo Frammartino was inspired by Pythagoras' belief in ''four-fold transmigration'' of souls, but his film is far more physical than philosophical. In gorgeous long takes he captures the daily routines of the herder, a baby goat, an imperious tree and a humble charcoal kiln. Plus there is a scene-stealing cameo from a stubborn sheepdog, who hilariously interrupts an Easter Procession. Working as both a spiritual investigation and a documentary of Calabrian life, Le Quattro Volte's placid surface hides a complex understanding of humanity. Everything is connected in Frammartino's sublimely mystical universe, in which he finds both humor and pathos in the hypnotic rhythms of everyday life. Dialogue is overrated. Sure, I love a beautifully composed verbal exchange filled with wit, insight, and quotable lines as much as any writer, but at its core, film really is a visual medium. While many great movies are filled with long conversations and revealing discussions, the actual language of cinema is not made up of words at all. No, the language of cinema is comprised of images, and in the hands of a great director those images alone are capable of telling a story and evoking a mood. The 2010 Italian movie, 'Le Quattro Volte,' is such an undertaking, weaving a loose and meditative rumination on our physical and spiritual existence within the natural world. With virtually no dialogue, music, or traditional dramatic action, director Michelangelo Frammartino relies only on visuals and ambient sounds to create a unique and surprisingly powerful piece of esoteric cinema, that, despite its occasionally cryptic features, is actually remarkably simple. According to the official synopsis, the film is inspired by Pythagoras's idea of "four-fold transmigration," which states that souls travel from human form to animal to vegetable to mineral, and indeed this metaphysical voyage forms the overarching structure of the movie. With that said, the plot is extremely loose and devoid of conventional characterizations or developments. In fact, the movie takes on an almost experimental/documentary quality at times, fusing a deliberate and orchestrated thematic purpose with an occasionally factual depiction of nature and life. The film starts off by focusing on an aging goat herder. Depicted through a series of wide, lingering shots, we follow the old man as he goes through his daily routine. In these early sequences Frammartino rarely moves the camera, and the sustained, still frames create an artfully voyeuristic mood. As the herder repeats his regular schedule, the images come together to form a kind of slow building rhythm, revealing a quiet beauty to the setting's quaint Italian village and its stirring countryside. In addition to the goat herder, fly-on-the-wall observations are made of the village as a whole, and one particularly fun sequence features a wide shot of an Easter parade that is broken up by an amusingly aggressive dog. Eventually, the movie follows through with its premise, and we move our focus from the goat herder to a newborn goat. Just as with the old man before, the film then starts to track the daily routine of the young and curious creature. When the goat's journey is done we transition to a tree, and finally minerals themselves as the lumber from the tree is dried for firewood. All the while, the filmmakers maintain a slow paced, documentary style lyricism to the proceedings, presenting the images and simple, potentially uninteresting events with a kind of deeper poetry. With its experimental, nontraditional approach and thought provoking examination of death, rebirth, and nature, 'Le Quattro Volte' actually reminds me of another recent, esoteric release, 'Uncle Boonmee Who Can Recall His Past Lives.' While they both share many stylistic and thematic features, in many ways, Frammartino's effort actually represents the kind of film that I wanted 'Uncle Boonmee' to be (though that's still a very solid movie in its own right). Simultaneously abstract and extremely literal, there is a level of cohesion in form and content here that escapes that other effort. The director's style is so assured and deliberate that he ends up wielding a complete command of tone, content, and pace. This is a film about scenery, location, ambiance, and small seemingly unimportant moments. Through his contemplative, long takes and infrequent but purposeful camera movements, Frammartino captures the intangible essence that lays hidden between actions and impulses, man and beast, life and death. No shot is wasted, and it all fits together naturally to add up to a larger and ultimately profound whole. In reality, nothing really happens. We watch an old man, a newborn goat, a tree, and a burning kiln go about their mostly inconsequential days with very few attempts at manipulated drama, and yet, somehow it remains consistently compelling, sometimes amusing, and ultimately, even enlightening. 'Le Quattro Volte' is not for everyone. Many might be turned off by its lack of dialogue, score, and actual drama -- and they're not wrong to be. This isn't a traditional film and its goals and methods are very different from those of mainstream cinema. While I can totally understand how some viewers might find this to be a pointless and boring exercise in beautifully shot banality, for me, there is a certain majesty to its images, a kind of elegiac but still celebratory visual cadence, that ends up carrying us through an otherwise potentially dull experience. This is a film about the cyclical nature of existence and mankind's relationship to the natural world. Through its images and sounds, 'Le Quattro Volte' reveals the unknowable harmony that connects all things. Its revelations are both grandiose and excessively mundane, espousing the everyday miracle and tragedy of life. It may not be for everyone, but those that enjoy more methodical, visually centric films should not hesitate to check this out. 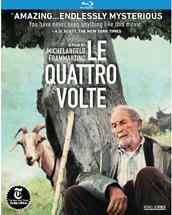 Kino brings 'Le Quattro Volte' to Blu-ray on a BD-25 disc packaged in a standard case. After some logos and warnings the disc transitions to a standard menu. The movie is provided with a 1080p/AVC transfer in the 1.85:1 aspect ratio. Filled with many beautiful shots of nature and peaceful Italian countryside, the film's video transfer looks rather nice. The print is in good shape but there are a few isolated specks, usually in transitional shots. A light layer of grain is visible throughout giving the picture a rich, film-like quality. Clarity is good, but the movie's heavy use of wide shots does limit the vantage point for some of the image's finer details. With that said, the various locations within and around the Italian village setting look lovely. Colors are rich and naturalistic without appearing oversaturated. Black levels are solid and while whites can be a little blown out at times, overall contrast is good. Some noise is visible in a few darker shots and in some of the film's cuts to complete black, but this is mostly negligible and doesn't hurt the presentation. 'Le Quattro Volte' is an extremely visual movie that relies heavily on its compositions and scenery to tell its story and evoke emotion, and thankfully this transfer does a good job of presenting those images faithfully. Though detail is a little on the soft side, the visuals still carry a pleasing and natural quality. The audio is presented in a Dolby TrueHD 5.1 track and a Dolby TrueHD 2.0 track. Since there is essentially no dialogue, there are no subtitle options. This is a very quiet film, but its subtle use of atmospheric sounds does play an important part in the experience, and while this track is very subdued and stripped down, it's also surprisingly effective. With no real dialogue or score, the film's sound design is basically comprised of the natural ambiance surrounding the various locations depicted. Numerous soft sounds of nature creep into the proceedings, adding little bits of subtle immersion. Though extremely front heavy, there is some nice separation across the center, left, and right channels. Some sporadic surround use also comes into play when appropriate and a few transitional shots actually feature some minor bass activity that adds a slightly ethereal quality to the mix. Fidelity is strong, and each tiny effect, from birds chirping, to dogs barking, or little footsteps through the grass, comes through with aural precision. The film has a deceptively simple audio mix, and while there really isn't a lot here, what is presented works well with the material and sounds pretty good. Theatrical Trailer (HD, 2 min) - The film's theatrical trailer is presented in 1080p with Dolby Digital 2.0 sound and English subtitles (an Italian narrator explains the movie's four-fold transmigration concept). Stills Gallery (HD) - Six fairly low quality stills from the movie are viewable. Also Available from Lober Filme (HD) - Four trailers for other Kino Lober releases are included. 'Le Quattro Volte' is a contemplative reflection on the cyclical nature of existence. While its pacing, style, and lack of traditional narrative elements might put off many potential viewers, those open to more experimental and methodical pieces of filmmaking will find a lot to admire. The video transfer is good and does justice to the movie's strong visuals, and though very subdued and quiet, the audio mix respectfully translates the film's subtle sound design. Supplements are disappointingly absent, but the solid technical presentation and the film itself, still make this a disc worth recommending.